Our cutting edge Symphion Software products are at the core of our Information as a Service™ Solutions. All Symphion Software Products utilize “agentless” scanning. By design, we have chosen not to install any software on target assets to be scanned, instead we rely on each manufacturer’s native agent. Our agentless choice enables rapid implementation, adaptability to change and avoidance of disruption to our busy customers’ already busy workloads. All scanning is not equivalent. Our advanced products allow our concierge teams to not only segment systems but also to adjust scanning using advanced multi-threaded capabilities to the demands of the IT Eco System being scanned. Our teams incorporate advanced scanning patterns and techniques designed to provide comprehensive reporting for each different system and chosen field of scan. Each Symphion Software Product leverages its own versioned historical repository to enable past, present and future reporting, analyses and trending. All Symphion Software is built to work on all Internet Protocol (IP)-enabled assets regardless of make or model. All Symphion Software Products are built on an extensible framework to allow us to commit to technical and business innovation and adaptability to enable customers to do business as they choose to do business and as their needs arise. 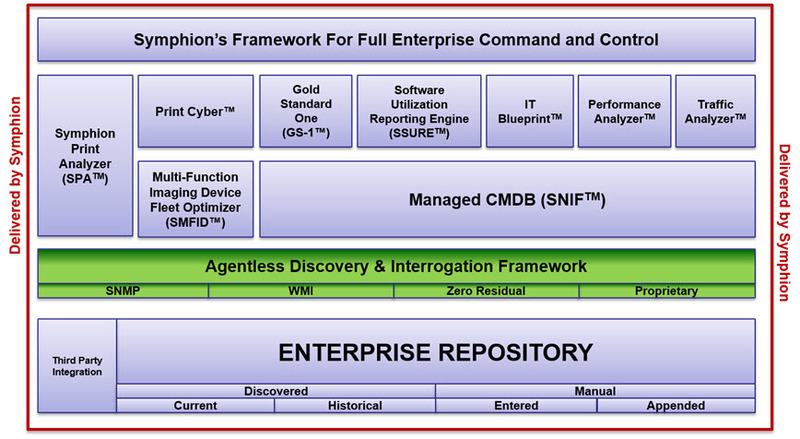 Symphion Software has been designed to service large enterprises. All Symphion Software has been built using and is deployable on Microsoft technologies for compatibility and to allow customers to utilize what they already have and has been designed to be remotely implemented and operated. Most Customers never log on to Symphion Software because they choose instead to leverage the service of our concierge teams and the seamless monthly discipline that they provide. However, each Symphion product has been built for ease of use and has an intuitive user interface. Symphion Software has been built with security in mind with features such as tiered privileged access, multiple authentications, required complex and renewed passwords, encrypted communications and logging. A key differentiator with all of our six (6) cutting edge software products is that they are all deployed with our concierge delivery. Customers don’t have to train on or learn how to operate software. Rather, they simply need to focus on using the valuable information to more effectively run their businesses.